Discussing the Colombian law which bans wild animal acts, attendees also learned about the ADI Operation Spirit of Freedom rescue mission, during which similar legislation was enforced in Peru and began in Colombia, and how our rescued animals were getting on in their forever homes, one year on. Eduardo Rueda, director of bioethics Institute of University Javeriana, and Carlos Muñoz, director of legal office on animal protection of University Libre of Cucuta, also spoke at the forum which ended with a cocktail reception sponsored by Opain – El Dorado airport, during footage of the Spirit of Freedom lions being relocated to their forever homes in Africa was shown. You can adopt your favourite lion here! 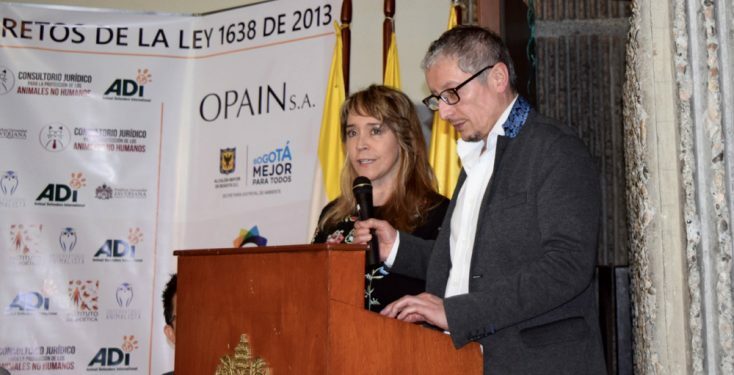 Attendees of the event included representatives of the Attorney General’s Office, Public Prosecutor’s Office, as well as members of Congress and Councilman Álvaro Múnera from Medellín.